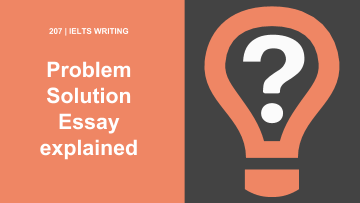 What is a “problem and solution” essay? A “problem and solution” essay, as its name suggests, proposes a problem to you and asks you to suggest a solution or solutions to it. It may also ask about the causes of the problem, or the effects which the problem has. As with an opinion essay, there is no right or wrong answer. What is being tested is your competence in writing English, not your skills as a policy-maker! Can you give me some examples of possible questions? How are “problem and solution” essay questions structured? Each of these questions has something in common. Each of them begins by stating a problem, asks about the causes (or sometimes about the effects) of the problem, and then asks you to propose the solution. As usual, the structure of the question should give you your cue for how to structure your answer. Problem-and-solution essays fall naturally into two parts, the first describing and exploring the problem, the second setting out the solution or solutions. For these purposes, treat questions about the causes or effects of problems as part of the description of the problem itself. Let’s take a concrete example from the series of examples which I gave earlier. Here there are in fact two questions, a question about the cause of the problem (“Why is this?”) and a question about possible solutions to it. This indicates how the essay should be structured. 2. Then, in a second paragraph, offer your account of its solution. So far, so good! But this is all quite general. How might one go about answering the question in detail? Let’s consider first how to describe the problem. The first thing to do is simply to state the problem, with examples or illustrative descriptions, if possible. One can begin simply by restating the problem. With this opening sentence, you have not only restated the problem. – You have also added to it, giving a qualitatively richer description. – You have made it clear that the problem is not confined to the elderly, but also affects other age groups too. – You have also introduced the question of social class. Try to develop your description of the problem a little bit more. For example, what is the problem (in this case, loneliness) like for those who experience it? What are its consequences? You now have a fuller, qualitatively richer description of the problem. Good! This could be expanded further, but the approach to take is clear. Now it is time to move on to the question of causes, which you should treat as part of the description of the problem. Single-cause or “monocausal” explanations are sometimes less persuasive than explanations which take into account a variety of factors. Here is an example of an attempt to address the question of the causes of loneliness in modern societies. The answer starts by admitting uncertainty. It is an indicator of strength to be able to concede limitations to one’s knowledge. There is more that could be said here, but it is time to move on to proposing solutions. Remember that you are not limited to any single solution. It is quite in order for you to suggest a number of solutions. This is possible even if the suggest solutions seem to conflict with each other. You are simply being asked to canvass one or more possible solutions. it prepares the reader for the fact that you will offer a number of solutions to the problem. Here you have done something quite important: you have made a qualitative, rather than a merely episodic, distinction between your different points. In other words, the structure of your argument now appears logically motivated rather than merely accidental. You have begun with an immediately achievable practical solution, and have gone on to discuss a more ambitious and more general one. structure the essay clearly into two complementary parts, as well as how to link those parts. structure the argument internally so that it appears logical rather than merely episodic. Thank you, Anita! We will try to get an example essay up this week.